This is basically what hiking looks like (to squirrels). After the heat and humidity of summer, the crisp, fresh autumn air is a much-needed jolt to the system. One of the best ways to experience all that fall has to offer is to take a hike on one of Chippewa Valley’s many trails, where you can reacquaint yourself with nature, walk your dog, or just ponder the meaning of life. Downtown Eau Claire to East Side Hill • Start at the paved trailhead hidden across from the L.E. Phillips Memorial Library’s underground parking entrance on South Dewey Street. The trail brings you across to the north side of the river on an old railroad trestle S bridge, then across the newly replaced footbridge into Boyd Park. Take an immediate left after the Boyd Park Bridge and go along a wood-chipped hiking path. Before the trail ends you have to catch a left turnoff into the woods near the end of the clearing, onto a trail that eventually reaches Archery Park. From Eau Claire, go east on County Highway Q and take a right on County Highway L, and go south about a mile to the ski area parking lot • The Tower Ridge trails are wide and wind through the oak forest, around and over a number of steep hills. Several spots even have wooden benches to stop and admire. Although the trails at Tower Ridge can be a bit maze-like, just follow the signs and you’ll get back to your car. 10 miles northeast of Menomonie near County Hwy E • Hoffman Hills has nearly nine miles of hiking trails, chosen based on length and difficulty (lengths vary from 1.7 to 4.4 miles). At the north end of the park is a 60-foot-high observation tower. It’s almost never crowded, so pack a lunch to enjoy at one of the three picnic areas. 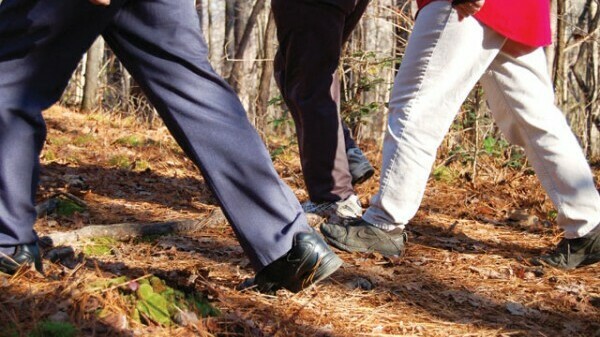 University of Wisconsin-Eau Claire • UW-Eau Claire warns hikers to stay on the Putnam trail’s wide dirt path as everything else that’s natural is studied for scientific research. The trail starts where the Little Niagara flows into the Chippewa River, marked with a gorgeous arched stone bridge. A semi-steep climb on newly constructed steps that takes you above the river for some photo ops. 10 miles east of Eau Claire off County Highway Q • Big Falls County Park is the site of considerable summer activity, though pleasantly devoid of such for the next half-year. The trails, though not extensive, cut through mixed coniferous/hardwood forest either side of county roads Q and K. Broad sand beaches and stout granite outcroppings make for good picnicking. From Menomonie, go west on Highway 29, turn left just after crossing the Red Cedar River, and left again on Rustic Road. Pull over when you get to a small bridge with metal guardrails; path will be on the right • The trail is not too difficult and it is short (about 1/2 mile), but requires some agility to climb up the small cliffs alongside three waterfalls. The gully widens and the path gets easier after about 500 yards. Check out the Devil’s Punchbowl, where you can take four flights of stairs down into the ravine, or walk around the rim. Hickory Ridge Trail This nine-mile trail, located in northern Chippewa County in the County Forest, begins in a parking lot off of 225th Ave. (Bob Lake Rd.). Irvine Park This two-mile trail is a gently rolling path for bikers and hikers. The trail is located in Irvine Park in Chippewa Falls on Bridgewater Avenue. Lowes Creek County Park Lowes Creek’s 11 miles of multi-use trails appeal to runners, walkers, and mountain bikers. Located off S. Lowes Creek Road. Parking pass required. Old Abe Trail Twenty miles of paved, multi-use trail running from Chippewa Falls to Cornell, winding through agricultural and forestland. One of the trailheads is northeast of Chippewa Falls on 97th Ave.
Red Cedar Trail A 15-mile trail connects Menomonie to Dunnville and shadows the steep walls of the Red Cedar Valley. Wildlife along the trail includes pileated woodpeckers, songbirds, turkey, grouse, pheasants, fox, and deer.